Austin Radiological Association, MSO LLC (ARA) provides medical imaging services at 17 outpatient centers, and professional radiologist services for 20 area hospitals in Central Texas. To effectively serve its healthcare customers, ARA has to be a highly-available, 24/7 digital enterprise. 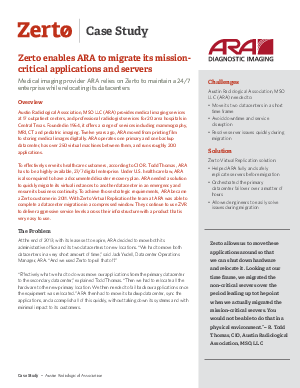 Under U.S. healthcare law, ARA is also required to have a documented disaster recovery plan, and needed a solution to quickly migrate their virtual instances to another datacenter in an emergency and ensure its business continuity.